I am on a roll. 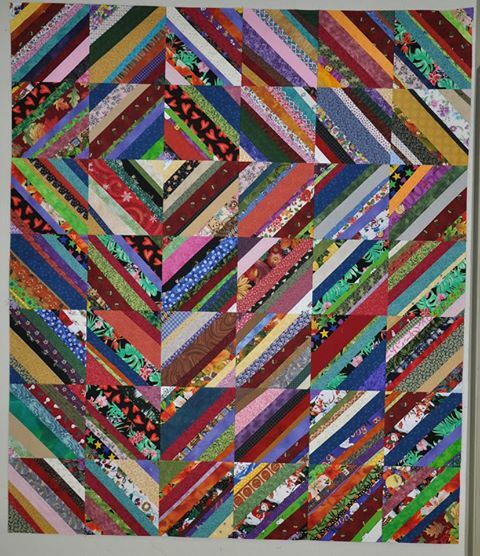 I am determined that all of the completed blocks that have been stacked on the shelves for years will be put together into quilt tops. After all, empty shelves allow room for new fabric purchases! Over the years I have used different techniques to piece together crumb or string blocks. The blocks in this top are strings pieced together onto muslin foundations. The many seams and extra layer of muslin make this a very heavy quilt top. I am not sure how this will be quilted yet because of the weight of the top. I am debating whether I will finish this one without batting or not. This entry was posted in flimsy, scrap, string blocks by Norma Hanson. Bookmark the permalink. Love your String Flimsy. It is motivating me to get my blocks off the shelf where they were put because I couldn’t decide on a layout.